At current rates of diagnosis, a man in the United States has a one-in-five chance that invasive prostate cancer will develop in his lifetime (69).This rate is nearly twice that of lung cancer and three times that of colorectal cancer. Death from prostate cancer is the second leading cause of death from cancer in men in the United States. Almost every man with advanced prostate cancer will undergo androgen ablation therapy and in time, most will progress. The central characteristic of fatal prostate cancer is androgen independence. These facts were established in 1941, when therapeutic castration was first described (53,54), and, unfortunately, still hold true as the 1990s drew to a close. 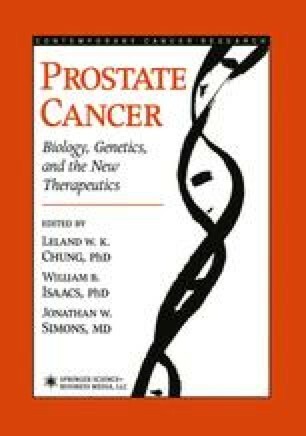 Historically, there has been an inverse relationship between efforts to maximize the efficacy of hormonal therapy for prostate cancer and the outcomes of those efforts: thousands of patients studied and billions of dollars spent repeatedly show hormonal therapy to have dramatic—yet ultimately ineffective—therapeutic effects (67). Although a number of growth and survival factors have been implicated in the androgen independent phenotype of prostate cancer, there has been no translation of these findings to effective therapy (87).